We’ve always loved going to the Toronto boat show, held in the deepest, coldest part of January every year. Two years ago we were spending our first winter aboard Grace V and were living in a marina just a few blocks away from where the boat show is held. The Polar Vortex had just descended on Toronto a week before the show opened; I was pretty excited for the distraction from the cold, snow and ice and the reminder that someday summer would come again! 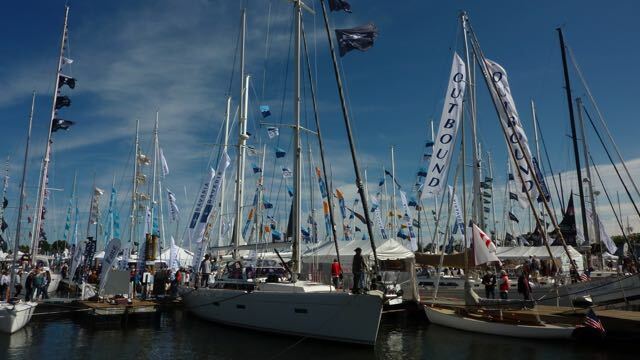 The Annapolis Sailboat Show is a huge contrast to the Toronto show. It’s held outdoors, in October and all the boats are in the water! I have to say, it’s way more fun. As we were arriving on the second day of the show (October 9th) we were concerned that Spa Creek might be chock-a-block full of boats. Our friends on Mighty Fine and Mar-a-Largo were already in the creek and radioed us to let us know there was still room for another boat! We dodged the boats moored in the Severn River, and waited for the 4 o’clock bridge opening to enter the creek. This is where the engine problems we’d been having really became an issue. We were having difficulty with the engine revs surging and falling back. It had been happening for the better part of the day and now that we wanted to hold ourselves still, while waiting for the bridge, putting the boat in and out of neutral was a problem. We did donuts in front of the bridge waiting alongside two other boats for it to open. I’m sure the others wondered what we were doing as they sat patiently in one place. Once through the bridge we found Mar-A-Largo and they offered suggestions on where we could anchor. The creek was pretty packed and we hadn’t had much experience anchoring that close to other boats, so we decided to play it safe and headed further up the creek to look for more space. We found our spot ideally situated near a park with a dinghy dock – perfect for Poppy! 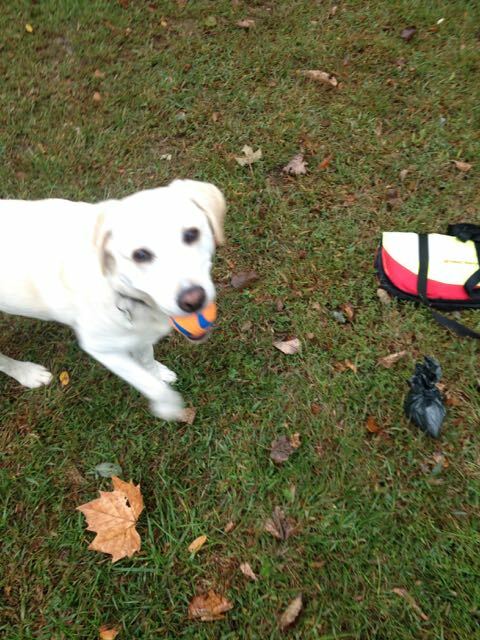 Bad pic of Poppy playing with her ball. She moves too much to get a good picture. As this was our 22nd wedding anniversary and we were exactly where we wanted to be – at the boat show, having arrived on our boat, it was pretty special for us. Craig, Donna and Dylan (the dog), from Mighty Fine came by to say hi and joined us in the cockpit for a drink to celebrate. Craig and Donna also invited us to join them for dinner in town and we quickly said yes! They headed back to their boat to get ready and we agreed to meet in 15 mins later. We headed below when all of a sudden it got very dark. Tim and I scrambled to tidy the deck as the wind picked up and a storm moved across the sky headed for the harbour. It packed a punch when it hit moments later… we swung towards shore and thankfully missed the piling behind us by about a good 12 or so inches! It was closer than we expected! Our anchor held tight and we sat out the rain inside our enclosed cockpit before heading into town for dinner about a half hour later. 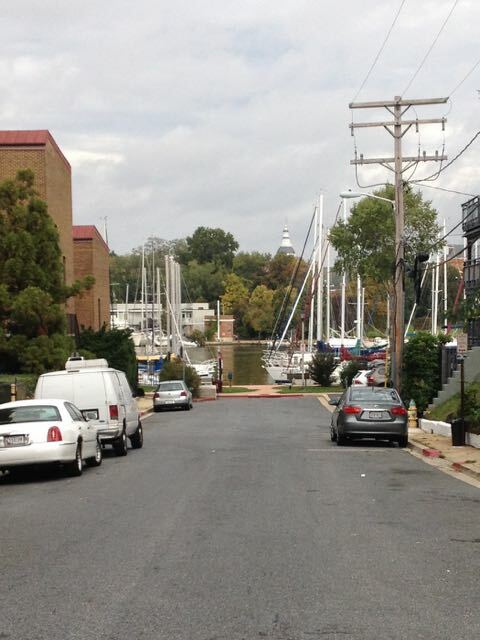 City streets in Annapolis that end in a dead end at the creek have a dock for dinghies to tie up at. This is so amazing and we used 4 different docks during our stay depending on where we were headed. 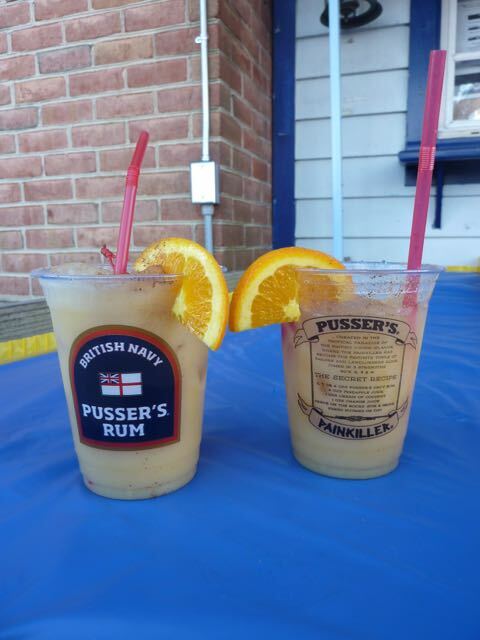 We had one for going to restaurants, one for walking the dog, one for shopping and another for going to the boat show! You can park your dinghy at the end of streets like this! Our day at the boat show was a beautiful sunny day – big contrast to when we were here two years ago and it poured rain EVERY day. We started our day having breakfast with Craig, Donna, Brian & Jane (of Mar-a –Largo) at Chick & Ruth’s Delly on the main street. Apparently a popular choice, the restaurant was packed and there was a huge line-up outside. Luckily the sun was shining and the food was worth the wait. After breakfast we headed into the boat show to tour the tents and check out the latest and greatest in boat stuff. Lots of toys to enhance our cruising, but with no budget allocated for such things we came away with very little. While at the show we bumped into Paul and Sheryl Shard from Distant Shores. Paul and Sheryl’s TV show has been a staple in our lives for a few years now. We’ve met them a few times before, always attending their seminars at the Toronto Boat Show. Tim’s parents met Paul and Sheryl when both couples were wintering in Malta many years ago. Now, Tim’s parents go to the same Tai Chi classes with Paul’s mom back in Canada. It’s a very small world… It was super cool to catch up with them and to let them know that we’d come to the show by boat. They introduced us to a few other cruisers and we all had a great visit. 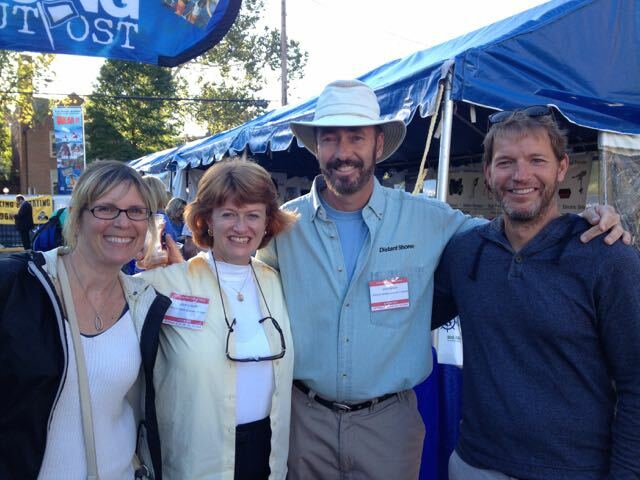 We hope to meet them again soon and this time on the water instead of a boat show.